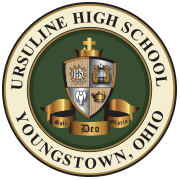 Ursuline French Teacher, Mrs. Lisa Devlin, is the 2019 Diocese of Youngstown Golden Apple Award Winner. Mrs. Devlin is an active member of the Ursuline Family. In addition to her teaching responsibilities, she is the advisor of The Ursulinian (yearbook), Global Rovers, French Club, and is a director in the Ursuline Theatre Department. She is chairwoman of the World Languages Department and has served Ursuline on numerous committees throughout her career. Mrs. Devlin began teaching at Ursuline in 2011. Prior to teaching at Ursuline, Mrs. Devlin taught at Cardinal Mooney and Canton Central Catholic High Schools for 6 years. Mrs. Devlin also serves in a variety of volunteer leadership roles in the greater Youngstown community. Mrs. Devlin and her family are active members of Saint Columba Cathedral Parish. Her daughter will be in the Ursuline Class of 2026. Mrs. Devlin will be honored at a dinner later in the spring at the Youngstown Country Club. Congratulations! Posted in Feature on Homepage, News.